The near capacity crowd at the Centre for Advanced Journalism’s session The Post-Mortem on Journalism Reform: What Happens Now? 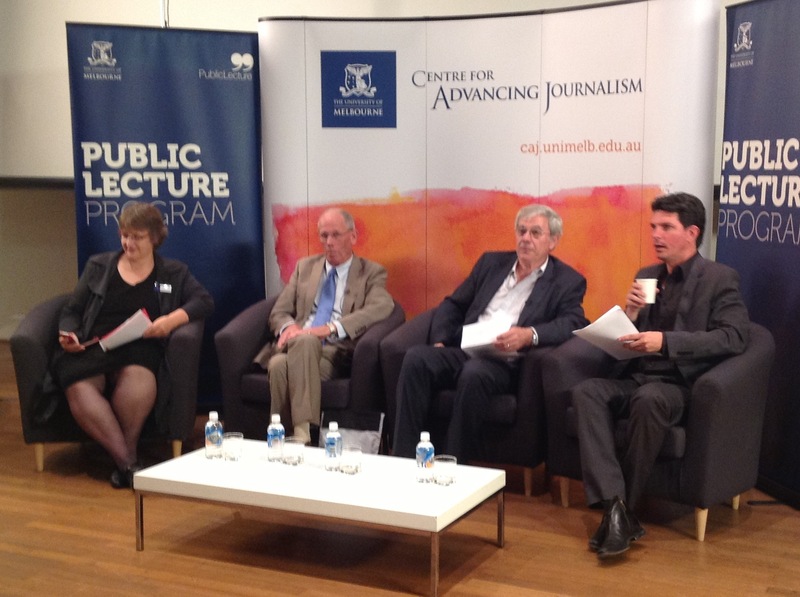 belied the conventional wisdom that media reform in Australia is dead (Details and the live blog are here). The venue was the aptly named Elisabeth Murdoch theatre at Melbourne University. But let’s not dwell on her infamous son despite the presence of his large press prints all over the issues discussed. The following is a personal reflection on some of the matters raised. Convergence and concentration: Whither/wither media reform? Panel members left little doubt that there is no chance for major reforms to legislation or self-regulation in the near future. Julian Disney, Chair of the Australian Press Council, was the most optimistic. He would like to get his ambitious agenda revitalized: broadening Council membership to all the so-called converging media: print, broadcast and online; establishing community input; enhancing complaints procedures; defining journalistic ethics, standards and codes of practice; gaining the ability to initiate complaints. On the issue of media concentration there was no consensus. Media Watch presenter, Jonathan Holmes, spelled out the financial reality – no one is going to buy a stand-alone daily newspaper. He hopes that here may be greater diversity in the medium term through the emergence of independent online news sites with real penetration. There is little or no precedent for this in Australia at this stage. Players such as Crikey, Global Mail and New Matilda resemble feature magazines with no meaningful news gathering capacity. Perhaps he has the soon-to-be-launched Guardian Australia in mind. It will be a different voice but is hardly a truly new player. Perhaps the most intriguing part of the discussion concerned political bias in the mainstream media. The panel consensus, led by Greens Senator Scott Ludlam, was that bias is okay so long as we get a broader range of opinions by having more media outlets and owners. This publisher pluralism depends on the problematic proliferation of real online alternatives mentioned above. However, the old joke still fits: Freedom of the press is owning one. If new online organisations are controlled by the big end of town, the traditional media hegemony will continue, based on the shared worldview of the usual suspects. It may just mean more opportunities for the IPA turks and other think tankers to strut their neo-liberal stuff. Controlling the excesses of partiality, the audience was told, would only come through monitoring instances where bias leads to distortion of facts (lies for instance) or unbalanced coverage (more of jolly old Lord Whatshisname the climate scientist). The Press Council and media monitors like Media Watch are virtually powerless to rein in political bias per se. Standards that might be applied in this regard include: distinguishing between news and views; checking sources; contacting the key people before publication; fact checking. The kind of vilification that some News Limited papers poured on Senator Stephen Conroy recently seems beyond the reach of any code or regulations. Even the court of public opinion is unlikely to find in favour of politicians or political parties who seem to be regarded as unfair game. Just as worrying was the lack of redress for individuals who have been treated unfairly by the media. Julian Disney saw it as a real problem but Jonathan Holmes was not as concerned as he believes it rarely happens. Great to hear that people’s privacy is being respected at last. The shameless commercial current affairs shows must have abandoned the foot in the door and the camera at the bathroom window. Social media campaigns were suggested as one of the few ways to call out the worst cases. It is the hands of the public. Julian offered the prospect of community roundtables and a Press Council community advisory group. Fine in themselves but hardly a knockout blow to gutter journalism.